A divorce in Angel's previous family brought her to a rescue group when she was a young dog. She recently celebrated her seventh birthday in her new home. 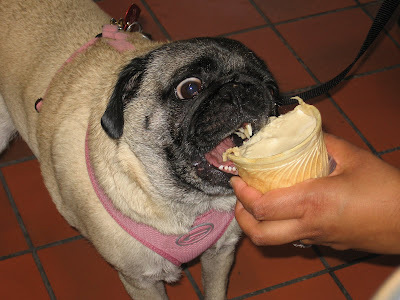 Before adopting our pug, we swore we would rename any dog that came to us as a “Pugsly” or a “Buster” or any other cutesy name. 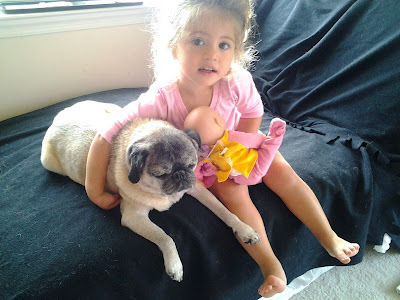 And while “Angel” is not our preference, it most definitely suits our sweet 7-year-old female pug. Angel came into our lives when she was 2.5 years old. We adopted her in May 2007. Even then she was more of an old lady than a young adult, content to sit and nap on our laps instead of run and play with other dogs. We immediately fell in love with Angel’s sweet, cuddly personality after meeting her briefly at an adoption event in Wheaton, Md. We submitted our paperwork and knew she would be ours, but that didn’t stop us from telling others at the adoption event, who openly talked about adopting her, that Angel was taken. Angel was put up for adoption because the couple she called her family was getting a divorce. Angel went to live with one-half of the couple. (We never knew if she ended up with the husband or wife.) The expense of a dog for someone on a limited income proved to be too much, and Angel’s owner specifically cited the cost of having to pay for an apartment with a pet fee as a limitation to his/her finances. Thus, Angel was put up for adoption. She was originally going to go to a shelter, but a friend of the owner suggested Angel go to Maryland Pug Rescue (now merged with Mid-Atlantic Pug Rescue) instead. Shelters are great places in terms of giving animals another chance, but they can also be terrifying places for some dogs. Knowing Angel and how anxious she can get, she would have been extremely upset in such an environment. Luckily, she went to live with a Mid-Atlantic Pug Rescue foster family in Ellicott City, Md., that included two adults, three kids, three dogs, and one other foster pug awaiting his turn to be adopted. We were told that pugs typically stayed in a foster family for about a month to assess any behavior and health issues before being listed for adoption. Overall, the adoption process—from submitting our first application to finally adopting Angel—took about three months. Before Angel, we were denied by various rescue groups along the east coast for various reasons. We found a pug at a shelter in Prince George's, Md., and rushed to adopted her, even leaving work in the middle of the day, but just as we were about to pay our adoption fee, her family came in looking for their lost pug. Because we found the process so frustrating, we reached out to the Maryland Pug Rescue for some advice. The president was very helpful, and over our conversations, she told us about Angel. When we picked up Angel at her foster home in May 2007, she had no qualms about us. She rubbed up on us, happily jumped in our laps, and bolted into our car for the ride home. Her foster mom said that she could tell that Angel was meant to be ours by how happy she was to go home with us. With all our adoption misadventures, we feel the same way. Angel was meant to be ours. When we brought Angel home there was a period of time that we had to work on housebreaking, walking on a leash, and even playing with toys. Apparently her family never walked her, because she would constantly wrap the leash around us, as if she had no experience with it. And she just couldn’t quite figure out what toys were—which seemed really sad to us. We also discovered that prior to joining our family, Angel probably had a broken bone in one of her paws that was left untreated. The only regret we have with the adoption process is that we weren’t able to get any photos of Angel as a puppy. Having some photos would give us some idea of what she was like as a puppy and make us feel like we hadn’t missed out too much on those first two years. Still, it was our preference to adopt an adult dog that was already housetrained over those cute puppies. Four and half years after bringing Angel home, she is still everything we could want. She’s cuddly, sweet, and extremely nice to our toddler. We just celebrated Angel’s seventh birthday. Our daughter specifically asked to have a birthday party for Angel, so that’s just what we did. Angel is such an important member of our family; we can’t possibly imagine what it would be without her.